Some in the Canadian Conservative movement have half-correctly compared our party to the Democrats in the United States. While the philosophy shared between the two parties is as different as it is similar, our predicament can draw a few parallels. For instance, like the Dems we are perennially without power in our country; our members find their party in the wilderness. We both watch desperately as our good people and good thinkers are shut out the executive (Paul Martin’s appointment of the crypto-loyalist Michaelle Jean), the legislative (we cannot form government without Ontario), and the judiciary (rehearing of Chaoulli supreme court decision, the appointment of Supreme Court judges). Indeed, like the Democrats we are left helpless as our respective visions for our respective countries rest unimplemented. Fortunately, unlike the Democrats, the new Conservative Party of Canada has a strong philosophical base; for the most part, we have not reverted to chaos in order to determine what we stand for. The party has matured, found its footing and is almost ready for power. While our party may disagree on a couple of social issues, these are not significant hurdles to the actual issues of governance. The Democrats however, find themselves turning hard-left under Chairman Howard Dean while rushing towards the centre with presidential front-runner Hillary Clinton. 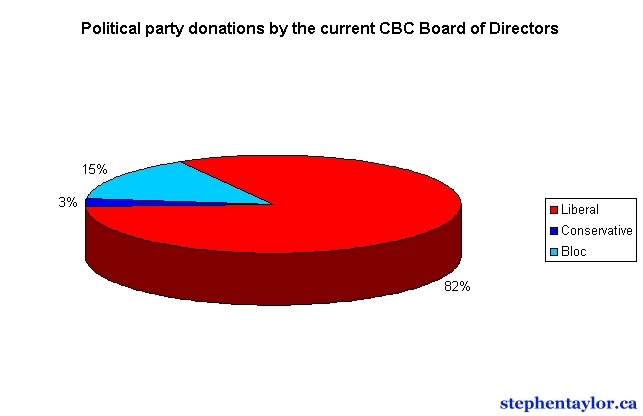 In contrast, Stephen Harper through his leadership has induced moderation and a common direction for the party. However, many on the outside, and those that channel PMO spokesman Scott Reid, still have the belief that Harper harbours undesirable motives. Therefore, the only similarity that can be drawn with the Democrats with this respect is that Conservative Party messaging is impotent; we cannot effectively control the message. Some say that this is a problem with “the mainstream media”. Now, let’s be realistic. Whether or not our perceived uphill battle against “the media” is true or not, it is how it should be. The media should be hard on us, however, let me qualify by saying that it should be hard on anyone that desires to run this country (Liberal party included). As a Canadian first, and a Conservative second, I would ask nothing less of the fourth estate than adequate scrutiny of anyone who wishes to lead this country. However, the media should be fair. Enter the blogosphere. Unlike the Democrats, we are winning the blogwars. I often attribute the greater order and dominance of the Canadian Conservative blogosphere to the very fact that our voices are marginalized and that our official party messaging implodes every time Don Martin points out a fault. The Democrats are losing the American struggle for blog dominance for one simple reason. While their messaging is equally troubled and their voices marginalized (yet not to the same degree despite the ‘dominance’ of Fox News), they do not speak with any semblance of unity. For the most part, Canadian Conservative bloggers are focused, organized and thrive in their cohesion. At the core of their repective problems, the Conservative party and the Democrats are quite different yet similar in the end. While being anti-war could be the most identifiable casus belli of the Democratic party, they lack unity on this issue with John Kerry’s voting for/against the war and Hillary Clinton’s equally polyvalent stance. Comparatively in Canada, no Conservative is ‘pro-Adscam’, however, we fail for the same reason as the Democrats. In the end, the Conservative Party and the Democrats must offer real solutions and positive vision for our respective countries. If we should lead, our party should look forward. If not, we fill find ourselves mired in regress. In a recent column concerning the Conservative Party of Canada leadership race, Rex Murphy mused perplexedly over the paucity of confabulatory prose by this nation’s columnists and news writers on the topic of the race. Rex, the leadership race is not dead. Your editors have merely found another story and they’re running with it. I’m talking, of course, about the American Democratic Party Leadership Race. Why is our nation’s news media so focused on a topic that they usually abhor? Indeed, our national news peddlers tend to give American news less attention than its worth. Yet, why does our opposition’s leadership race get so much less coverage than the American’s opposition leadership race receives? The American Democrats and the Canadian Conservatives are trying to do the same thing, in effect: change the government. However, Peter Mansbridge has spoken more about John Kerry than Belinda Stronach, and we’ve heard more about Lieberman’s Joementum (or lack thereof) than we have heard about Tony Clement. Our leadership race is news. Rex, you should ask your editors why they’re choosing to ignore the story. Without media coverage, our leadership contenders can only be heard as far as they can shout. Mr. Murphy has declared that Belinda Stronach, Tony Clement and Stephen Harper have all climbed inside a “Trojan horse”, ready to attack the Liberal party’s stranglehold on power. It’s not that the three intend to stay within the horse, rather, it’s that nobody has told the city of Troy that the horse is waiting outside its gates.